We want to be the last mattress you ever need to buy. With layers of dreamy memory foam, our crazy long trial period, and reasonable prices, you’ll rest easy in your decision to upgrade your sleeping experience to the Nectar experience. We understand that other companies and retailers mark up their mattress prices, but Nectar cuts out the middlemen, which is how we can bring you such high quality at such low prices. You can pay half the price for Nectar and still get all of the comfort, the investment for these other marked up mattresses just doesn’t make sense. Nectar’s combination of layers and materials creates the medium firm feel that has earned its name “The Most Comfortable Mattress.” Coming in at at the ideal combination to give you soft support, Nectar is all you need for a good night’s rest. Back sleepers, side sleepers, stomach sleepers, and those who rotate throughout the night: we’ve got you covered. Our 5-layer mattress distributes your weight evenly while memory foams provide rebound and bounce. A custom-milled, quilted cotton top layer & Tencel Cooling Cover wicks away sweat and circulates air to prevent overheating. You end up with a comfortable night’s rest. No more too-hot mattresses. Just easy mornings. Speaking of satisfaction, let’s talk layers. Nectar has five layers that are just waiting to cradle you into sleepy bliss. We use the best materials, integrated with a totally unique design to give you comfort without ever sacrificing support. Each tier of our five layered mattress construction works together to make sure that your sleep will be as good on the thousandth night as it is on the first. So what makes these layers so unique? We’re glad you asked. Tencel Cooling Cover – While other mattress companies have problems with overheating on a memory foam mattress, at Nectar, we have curbed this issue with our long staple tencel cotton cooling cover. This fabric is custom-milled to breathe, draw away heat, and circulate fresh air with every move you make. That means that our mattress can wick heat away, circulating fresh air every time you shift to find your comfort zone before bed. The Nectar cover allows you to maintain the perfect temperature each and every night. Quilted Gel Memory Foam – While memory foam has become a go-to for many mattress companies, we use the quilting process to make sure the Nectar is in a separate class all its own. Quilting is an expensive technique that gives extra loft and comfort while also promoting breathability, meaning that you’ll always feel light and airy whenever you lay down — never smothered. With Nectar, we’re determined to bring you the highest quality at the lowest price because your satisfaction is our greatest concern. 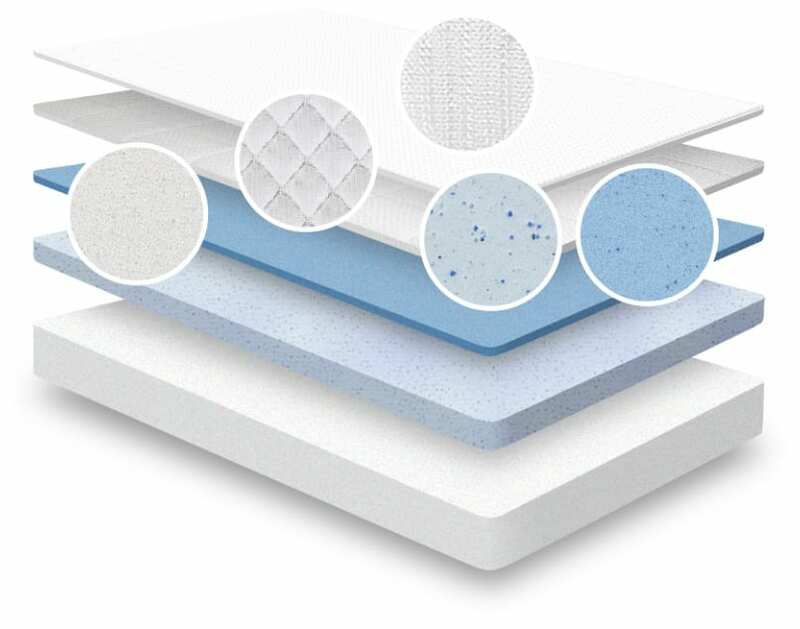 Semi-Open Lush Foam – Our memory foam holds five different patents, and is considered one of the most premium gel foam available. Usually used expressly for medical purposes, we wanted to make sure our sleepers had the best. This foam actually absorbs and redistributes heat, but can still recover perfectly to its original untouched state. That means our sleepers are getting a consistent and beautiful sleep every time they curl up on our mattress. Adaptive Hi-Core Memory Foam – This is where the support truly comes in. Hi-Core memory foam is usually avoided by other mattress companies because it’s so heavy and expensive to ship. We didn’t want to compromise on quality, so we added this as our fourth layer of support. This is what allows our mattress to contour and support along your pressure points as you sleep, creating a totally unique sleeping environment. Breathable Base Layer – Again, we didn’t want to settle for what other companies have done, so we went ahead and upped the ILD rating from the industry standard 1.5 all the way up to 2.2. That means you’re getting a denser, more breathable base layer than your typical memory foam. It all translates into better ergonomic design, but most importantly leads to a beautiful, unbroken night of sleep for our sleepers. At Nectar, we believe in taking care of you every step of the way. We will deliver your mattress free of charge right up to your door. Our mattresses fit every type of base whether your preference is box springs, divan bases, traditional frames, adjustable ones, platform ones, or a simple floor set-up. We’ve been able to create a quality night’s sleep without passing the price tag along to you because we’ve scoured the globe for the best materials at the lowest price points. That means you’re getting the best of the best, without the markup that you’ll find at traditional mattress stores. That, plus our easy delivery system, means that this is a low cost, low hassle way to get the mattress of your dreams. We take such pride in our mattress that we offer a 365 day no-commitment guarantee, meaning that you can sleep on this mattress for a full year and still return it at any time. That’s how confident we are that you’re going to love the way you feel on a Nectar. Still have questions? Give one of our representatives a call, we love to share our passion for our mattress. We’re confident one night is all it will take to show you why you’ve been missing out on the dreamiest sleep imaginable. When you spend a third of your life sleeping, that’s a big deal. In fact, it’s everything.